Facebook will welcome the admission of South Africa to the grouping of the world's key emerging markets (Brazil, Russia, India and China). Not only does South Africa add an "S" to the end of the club's name, but the group now has one country where Facebook is the dominant online social network. Although Facebook has recently overtaken ortkut in India, other social network applications have a significant lead over Facebook in Brazil (orkut), Russia (VK) and China (Qzone). 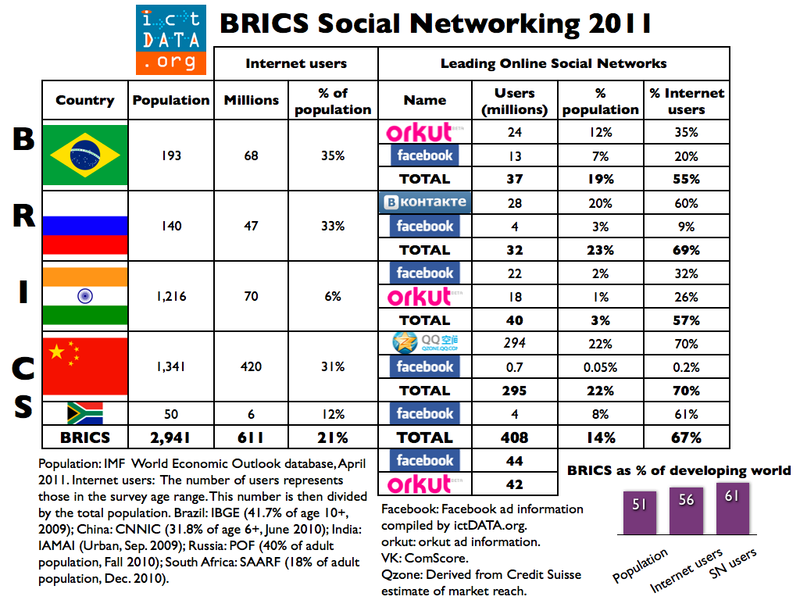 There are some 408 million users of social networking in the BRICS out which 364 million use Qzone, VK or orkut and only 44 million use Facebook. Total social networking users in the developing world number 661 million. This means that over half the developing world's social networkers do not use Facebook. The Brazilian national statistical agency IBGE reported 68 million Internet users aged 10 and over in 2009. This is equivalent to 42% of the 10+ population or 35% when divided by the entire population. 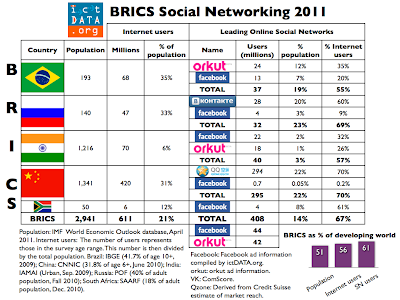 orkut reported 24 million active users while there are 13 million Facebook users; these two social networks are used by 55% of Brazilian Internet surfers. The Public Opinion Foundation (POF) reported that 47 million adult Russians used the Internet in the third quarter of 2010 (40% of adult population and 33% of total population). Vkontakte (VK) is the top social network site with 28 million users in August 2010 according to ComScore. Facebook has four million users in Russia. The Internet and Mobile Association of India (IAMAI) reported 71 million "claimed" Internet users in urban India (aged 8+) at September 2009. Some 40 million Indians access the Facebook and orkut social networking sites. According to the latest report from the China Internet Network Information Center (CNNIC) there were 420 million net citizens age six and over in June 2010. Tencent, the parent of the largest Chinese social networking site Qzone, reported 459 million active accounts in June 2010. This figure exceeds the number of Internet users (due to duplicate and overseas accounts). A market research report by a Swiss bank found that Qzone was used by 70% of Chinese Internet users or 294 million people. Facebook is virtually non-existent in China with less than 700,000 users. It should be noted that CNNIC reported that only half of Chinese surfers used social exchange web sites; the inconsistency with the Credit Suisse figure could be due to usage overlap. For example 72% of Chinese Internet citizens use instant messaging which is likely carried out within the Qzone QQ IM service. There were 6.1 million adult Internet users in South Africa in December 2010 according to the South African Advertizing Research Foundation (SAARF). Around four million use Facebook for a reach of 8% of the population which is the exact same proportion reported by SAARF for users of social networking. Suggested citation: "Half the developing world's social networkers do not use Facebook." ictDATA.org. 7 June, 2011. China Internet Network Information Center (CNNIC). 2010. Statistical Report on Internet Development in China. July. comScore, Inc. 2010. “Russia Has Most Engaged Social Networking Audience Worldwide.” Press Release, October 20. .
Credit Suisse. 2011. Tencent Holdings. May 17. Internet and Mobile Association of India (IAMAI). 2010. I-Cube 2009-2010: Internet in India. April 5.
International Monetary Fund (IMF). 2011. World Economic Outlook Database. April. Instituto Brasileiro de Geografia e Estatística (IBGE). 2010. “Tecnologia da informação e comunicação.” In Pesquisa Nacional por Amostra de Domicílios - 2009. Public Opinion Foundation (POF). 2010. “The Internet in Russia. Fall 2010.” Press Release, December 15.